A new chapter has been written in the KISS/Cadillac saga — literally. 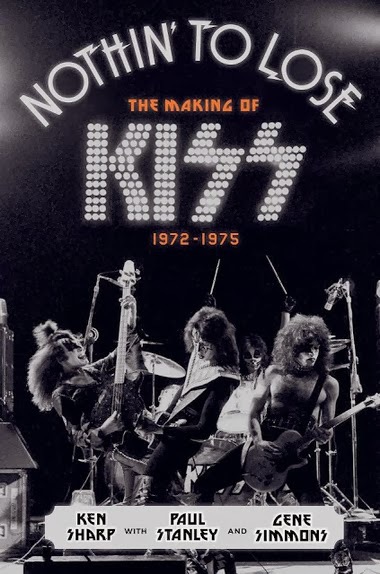 A just published book, “Nothin’ To Lose: The Making of KISS (9172-1975)” by Ken Sharp with Gene Simmons and Paul Stanley, features a 22 page chapter devoted entirely to Cadillac. Sharp not only recounts the now legendary rock and roll event, but offers fresh insights and perspectives. As the main architect of the KISS visit to Cadillac on October 9, 1975, I’ve retold the story countless times in print, online, on the KISSology DVD, and on television, most recently for ESPN. I’m included in this book, but what makes this retelling different from all others is that Sharp has included a wide variety of other voices and their recollections really make the story a far richer account of what happened. What Sharp has done is present an oral history by letting the people associated with KISS tell their stories. This includes not only Gene Simmons, Paul Stanley, Ace Frehley, and Peter Criss (the original lineup for the band), but also fans, booking agents, photographers, management, producers, promoters, roadies, and music journalists. For the Cadillac chapter, titled “Rockin’ in the U.S.A,” several local voices are a part of the commentary. These include: Cadillac High School head football coach Dave Brines, Cadillac High principal John Laurent, CAPS superintendent William Smith, players Dave Laurent, Harry Hagstrom and Bill Barnett, and cheerleader Milissa Codden. Many of their insights have never been chronicled before. Added to the locals are observations from KISS road crew members Rick Munroe, Mark Stinner and Fritz Postlethwaite, publicist Carol Ross, photographer Fin Costello, and even something from my brother, David, whose band, the Double Yellow Line, opened the concert. Enhancing this “local flavor,” what the book also does is put the Cadillac event into historical context, something I’ve not seen before. We all think of KISS as this juggernaut that has amassed more than $500 million in licenses and merchandising over the last 35 years. But when they came to Cadillac the band was hemorrhaging money and their management and record company were scrambling just to keep them afloat. They had album sales and a loyal following, but the cost of touring with their massive stage show was daunting, to say the least. Being such an integral part of this saga is why Cadillac continues to be so revered by rock and roll music fans worldwide.